Our sole purpose is to improve people's health and wellness with Dr Paul Lam's Tai Chi for Health instructional materials." In 1974 Dr Paul Lam, a family physician from Sydney Australia, took up tai chi to control his arthritis. 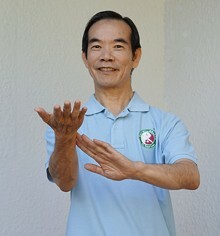 Tai chi not only helped him overcome his condition, it also improved every aspect of his life. Dr Lam has created a series of Tai Chi for Health programs and produced instructional materials to make tai chi easy and enjoyable to learn. Through Tai Chi Productions his team have produced many best-selling titles worldwide. In 2013, the Centers for Disease Control and Prevention and National Council for Ageing recommended Dr Lam's program. Many governmental departments around the world endorse them. One of the most sought after teachers, Dr Lam must be the first in history to have travelled over a million miles teaching tai chi. There are over eight million people around the world who have enjoyed and benefited from Dr Lam's Tai Chi for Health programs. Tai Chi Productions head office is located in Sydney, Australia, with offices/agents in USA, NZ, Singapore and UK. Our staff are dedicated to providing the best possible service towards our sole purpose. This is a tai chi pose in Sun style tai chi Leisurely Tying Coat, here meaning he has something useful to offer. Nuala is a Tai Chi for Health Master Trainer who has practised and taught Tai Chi for over 20 years. She has attended Dr Lam’s Tai Chi for Health workshops in the UK and one week workshops in the USA. Nuala teaches various local classes and also classes and demonstrations for recovering cancer patients. Nuala enjoys helping people obtain a better quality of life and improving health through their Tai Chi. Jennifer is a Tai Chi for Health Master Trainer who has been practicing Tai Chi for over 10 years. 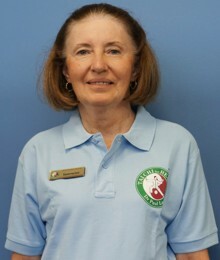 She conducts Tai Chi for Arthritis workshops and also teaches the Tai Chi for Health Programs. Jennifer works with various organizations, such as the National Arthritis Foundation, Osteoporosis Society Singapore, Health Promotion Board, People's Association, Women's Initiative for Ageing Successfully and the Council for Third Age by participating in their Active Ageing Promotional Activities.